Clear-Vu Lighting’s cleanLED is the first series of lighting fixtures designed, manufactured and tested to National Sanitation Foundation’s (NSF) Protocol P442, “Controlled Environment Lighting Fixtures”. NSF P442 is the first and only universally accepted publication that provides standards and testing procedures specifically for lighting fixtures utilized in pharmaceutical processing, bio-tech research, biosafety labs, surgical suite, clean room manufacturing, food processing and horticulture applications. 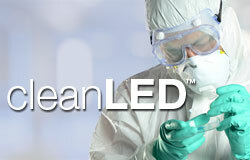 cleanLED is certified to resist leakage (NSF P442, IP66); resist corrosion and facilitate cleaning (NSF2 and NSF P442); operate safely in hazardous locations (Class I, Division 2, Class II, Division 2); Control Electromagnetic Interference (MIL STD 461F); and maximize performance and longevity of LED optical system (LM79, LM80, DLC Qualified). Lumen packages range from 5,000-20,000 lumens).